Some of my Facebook friends have been asking why I seem to spend more time on Twitter than on FB, and wonder what I see in it. I’ve started to realize that a lot of Facebook users kind of misunderstand Twitter, and don’t realize how much value is there. The two networks represent very different kinds of parties, and it’s not like you have to choose one or the other – you get very different things from each of them. I can’t imagine not doing both! Finally decided to put together this little guide to clarify a few things. Hope you find it useful! But my friends aren’t on Twitter! The first thing to understand is that Facebook is all about “the social graph” while Twitter is about “the interest graph.” For the most part, you “friend” people on Facebook because you’ve met them at some point in real life. Twitter is about reading and engaging with interesting people, whether you know them or not. The whole point of Twitter is find people with interesting stuff to say, and tune into their train of thought. If you’re waiting for your friends to join Twitter, you’re misunderstanding what the service is for. The social graph is great, but most people find over time that the people they’ve met aren’t necessarily posting about things that interest them. And yet manners require you to keep them in your info stream. As a result, your info stream on Facebook can get very cluttered with stuff you don’t care about (even if you do care about the people posting it). On Twitter, if someone bores you, just unfollow them! There is no social expectation, and it’s not considered rude. You get to curate your information stream, fine-tune it so it provides info and commentary on exactly what interests you. Neither do I. 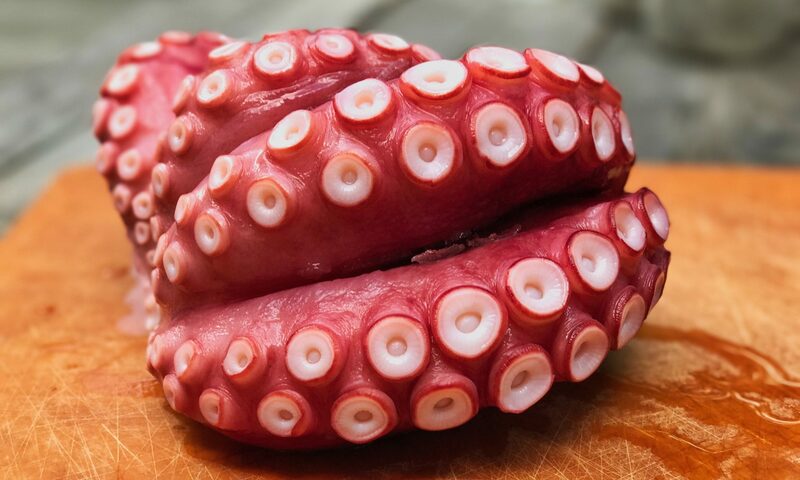 If you’re following people who post about what they’re eating, or other pointless nonsense, then you’re following the wrong people and damaging the quality of your info stream. And if you’re posting about what you had for breakfast, don’t expect people to follow you, since you’re not contributing substance. It’s no more common to find people on Twitter posting about what they had for breakfast than it is on Facebook. Twitter is not some kind of magical junk magnet. As for celebrities… Maybe I just haven’t found the right ones, but so far I haven’t encountered a single celebrity Twitter stream that has much of value in it (with the possible exceptions of Ruth Buzzi, Steve Martin, Rainn Wilson, and, uh @feministhulk, who is hilarious and awesome but probably doesn’t quite count as a celebrity). My advice: Don’t be seduced into following celebs – most of them will just cheapen your stream. There are hundreds of thousands of fascinating people out there who have way more to say. 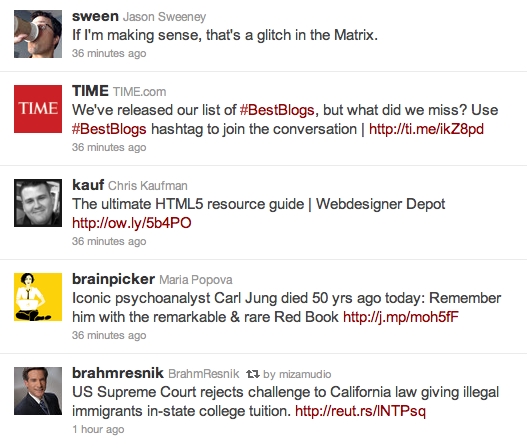 A brief snapshot of stuff from my curated Twitter stream. It goes on like this all day long – rivers of stuff that’s interesting to me. I just can’t find this kind of info concentration on Facebook. Check out my view of the river. But there’s so much more stuff on Facebook! Most people do only two things on Facebook – post and read status updates. Imagine if Facebook had no ads, no corporate pages, no “marketplace,” no Farmville, no Mafia Wars, and no “poking.” You’ve just imagined Twitter. It’s true that there’s a lot less “extra stuff” on Twitter – for many of us, that’s a good thing. Streamlined, to the point, and information-rich in a way that Facebook just… isn’t. What can you possibly say that’s meaningful in 140 characters? People like to joke about how there’s not much you can do in 140 characters, but guess what? The average length of a Facebook status update is only 160 characters. In practice, it’s not that much different! Yes, sometimes you do find yourself wishing you had a bit more space to play with, but for the most part, it’s really not that hard to push out a thought and a link, or a thought with a photo, in 140 chars. Also, constraints can be powerful motivators! The character constraint enforces brevity, which is good for you as a writer, and generally good for the audience, who will never have to wade through too many words to try and figure out your point. The character limit is both a strength and a weakness – explore how it can make you a stronger communicator. This is one area where Facebook definitely wins. While you can easily send a semi-public reply to anyone on Twitter, and you can send a private message to anyone who follows you, conversations are more lively and detailed on Facebook. At the same time, Twitter is like one big conversation the whole world is having. In a way, it’s all conversation. Just like the real world. Swim in it. How can you possibly keep up with it all? This is another common misunderstanding. People who don’t use Twitter often think of it like email, as if they were obliged to read everything posted by everyone they follow. Not at all! After you start following a few hundred people, you’ll find you can’t even come close to reading everything that gets posted in the course of a day. But it doesn’t matter – you’re not expected to. When you have a few minutes, take a quick dip and see what’s buzzing. If you have time, dive deeper. If you go a few days without reading, no matter. Do you read everything in your browser bookmarks every day? No way! It’s just an info stream – dip, sip or bathe when you have a few minutes here or there. Not having some social expectation that you’re “keeping up” actually takes a lot of pressure off. But isn’t Twitter fully public? Yes, just like the rest of the internet (besides Facebook). That’s its strength. That’s what makes it work so well. Facebook is made of millions of interlocking “privacy rings” that let you see some content but not all of it. Search engines can’t access the vast majority of what’s on Facebook. That’s not a healthy thing for the internet. If what you have to say is worth saying, don’t you want your words to have as much reach as possible? If you have something worth saying to the world, say it to the world, not just to a few people. Twitter lets you maximize the reach of your words in a way that Facebook doesn’t. I’m always surprised when people ask this. I ask them right back: How do you keep up with sports? Do you ever read a newspaper / news site? How do you keep up with pop culture? Do you enjoy learning new things? Being turned on to exciting ideas? Finding amazing links to check out? Twitter is all about discovery. Why not try using Twitter for tracking what turns you on instead of (or in addition to) whatever you’re using now? Twitter is fantastic for people who have limited time, because it surfaces so much so effectively. I just got on Twitter – What do I do? A common complaint of new Twitter users is that they create an account, look around a little bit, don’t see much going down, and give up. 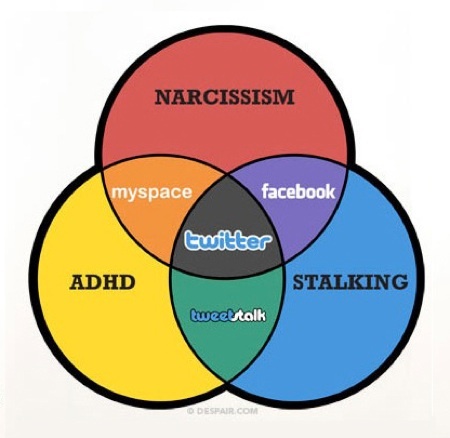 Here’s the thing: Because Twitter is based on the interest graph, you need to find interesting people! Until you’ve got a lively info stream buzzing with great stuff, the service isn’t going to sing for you. Please make this pledge: “I will not judge Twitter until I’ve found 50 interesting people to follow.” Sure, start by searching for your friends if you like, but don’t stop there – use the built-in search and search for what floats your boat. Things like “hiking” or “your favorite band name” or “your favorite athlete” or “wordpress” or “makeup” … you get the idea. Or, try the Who To Follow feature you’ll find in the Twitter.com menu bar. Once you find good people, look to see who they’re following, and follow some of those people too. Also, start posting right away. Don’t wait to have followers – just get the contents of your head onto the field. That way potential followers will actually have something to go on when deciding whether to follow you. Finally, don’t create a “protected” account – virtually no one will request to follow protected accounts, and it completely misses the point of what makes Twitter work. If you value “privacy” (whatever that is) so much, stick to Facebook. If you want to start growing a collection of followers, a few tips: 1) Be interesting. I know that sounds a little flip, but seriously – if you’re posting about your lunch, your workout, or other stuff that strangers aren’t going to want to read about, don’t expect to win many followers. Be funny, or be useful, make observations that have some substance, or post good links. Have real conversations, don’t fake it. ; 2) Make sure you add an icon/avatar to your profile. Most people won’t follow users without an icon (because they give off the air of not caring, and/or they look like bots); 3) Add something meaningful to your profile/bio. When people are deciding whether to follow someone back or not, they go on first impressions – profile image, bio, and most recent few tweets. Make that first impression count. How do I filter out the noise? Clay Shirky is famous for the line “It’s not about information overload – it’s about filter failure.” One of Twitter’s strengths is that you can fine tune it to become an excellent filter. If someone you follow is posting stuff you consider noise, just unfollow them, no regrets. Beyond that, there are two killer features that make Twitter an even better filter – Saved Searches and Lists. After doing a search, click the Save This Search button so you can get real-time updates on what the Twitterverse is saying about that topic at any moment. The other great one is Lists, which are collections of people grouped on a topic (you don’t even have to follow someone to put them on a List). Virtually all 3rd party Twitter clients support saved searches and lists, so you can switch between the web experience and the desktop and have all of your filters a few clicks away. Use these features – they make a huge difference. Is Twitter.com the best way to interact? No way. There are dozens of web-based and desktop clients for using Twitter, and virtually all of them let you do things you can’t do on twitter.com. If you’re on a Snow Leopard Mac, I highly recommend the official Twitter client in the App Store (free). Same goes on the iPhone or Android – dozens of options available, but I really like the official client the best. YMMV. To recap: Twitter and Facebook are two different kinds of parties – one with your friends and one with potential friends. You’ll become a broader person by doing both. It’s up to you to curate your info stream. You can unfollow people any time without repercussions. Public is better than private. Twitter is like Facebook with all the crap removed. It’s up to you to curate the perfect info stream. If you have time to read a newspaper, you have time for Twitter. BTW, I’m @shacker on Twitter. Or check out my view of Twitter.